We place precious data on these small electronic devices. It’s of no surprise that we wonder if it can all just disappear in the flux of electronic bits, bytes, capacitors, and transistors. It’s not easy to grasp how a USB flash drive can store all of our life’s work and keep it safe. Let’s dive in and figure out if these flash based devices can be trusted. USB flash drives and SSDs are fast and increasingly reliable, and are replacing the older tapes and hard-drives. I recall from the numerous studies, articles as well as just the common understanding between the IT professionals, the average lifetime of a hard-drive was between 3-5 years. As the flash memory reduced in price, the surge of the flash drives and SSDs has increased dramatically. However, the knowledge about their endurance or the lifetime of the flash memory based devices has been lacking. 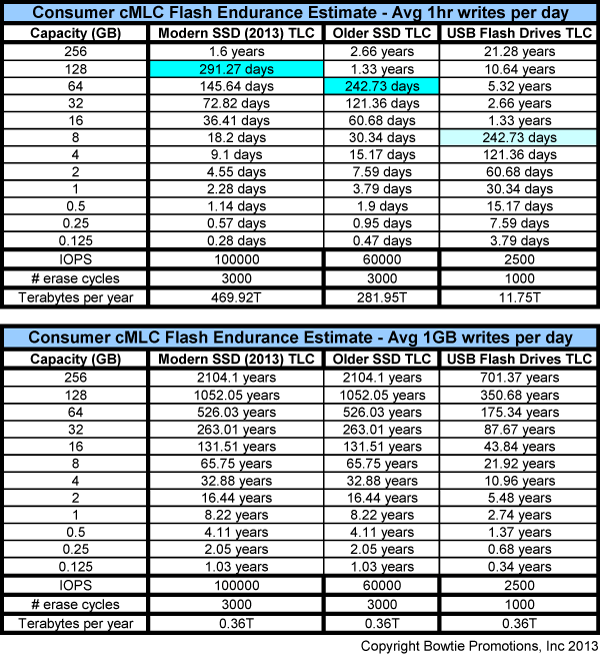 Many factors directly affect the longevity of the flash memory. Some of those factors are the quality and the type of the flash memory and the controller, and the intended use of the USB flash drive or SSD device. If you want the fastest answer without getting technical or getting bored with the details, the life of the modern USB flash drive or SSD would generally match or exceed the average lifetime of a hard-drive under moderate load – 3-5 years or more. We started the discussion on this topic in the previous post. It can be accessed here. Without knowing if there is any interest, we focused mainly on a theoretical time model of constant read/write load on the drive. 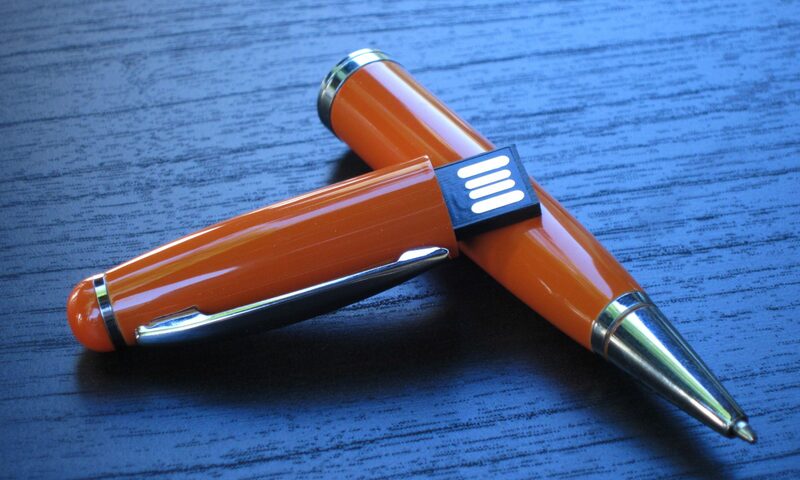 It was assumed that a USB flash drive would be written to 15% of the time under 24/7 365 days a year load. Since, this topic seems to perk the interest of a few readers, it was important to add more color into the dilemma of predicting the life and death of a flash memory device. It’s important to understand that the quality of the flash memory as well as the logic of the flash memory controllers can affect the performance as well as the endurance of a flash memory device such as USB flash drive or SSD. The models that are presented assume that the controller can distribute the writes evenly over the flash memory, and that the quality of the flash memory itself will stand up to the promised write/erase cycles. Below, are two models for computing the endurance of a flash based device. The first is the time model – given a specific write time each day, how much data can be written to a device and thus how long it will last. The second is the data model – given a specific data size, how long will the device last if the data size is written to the drive each day. All of the flash memory lifetimes are computed for the TLC type memory. This particular type memory is becoming the standard for the consumer based flash products. It has earned the clever marketing moniker cMLC. The topmost table, as mentioned before, depicts the time based model. The bottommost table depicts the data model. Both models assume 100,000 IOPS (Input/Output Operations per Second) for modern SSDs; 60K IOPS for older SSDs, and 2.5K IOPS for the USB flash drives. Additionally, both models assume that the SSD type flash memory is rated to 3K write/erase cycles, whereas the USB flash drive memory is rated to 1K. The actual numbers will vary; however these numbers are close enough for the modeling purposes. On the very bottom of each table is the “Terabytes per year” measure. This number clarifies how each model differs. In the time model, if the flash memory and the device are fast, then they will be able to write much more data in a given period of time. In the data model, time does not matter, because we are given a fixed data to write each day. The time model assumes that we’ll be writing on average about an hour per day. In the most extreme example of the time model, given a 256GB SSD (100K IOPS rated drive), you’ll have written 469.92 Terabytes worth of data per year or 751.87 Terabytes over 1.6 years before the drive’s ultimate end. In the slowest example of the time model, given a 256GB USB flash drive (2.5K IOPS rated drive), you’ll have written only 11.75 Terabytes worth of data per year or 250.04 Terabytes over 21.28 years before the drive’s end of life. Now the data model. You’ll notice right away that the Terabytes per year field is exactly the same for each drive. Here it does not matter how long it takes; you can have the fastest drive or the slowest. What matters is that you have a certain amount of data that you write per day. In case of our model, 1GB worth of data per day was chosen. Therefore, the written data per day will be 1GB * 365 day per year = 365GB per year or rounded 0.36 Terabytes per year. The time model’s results are not very appealing; however the time model is more suited for a server, professional CAD, or a audio/videophile who are constantly writing large amounts of data each day. For a casual user or a professional who does not reply on writing significant amount of data per day, the data model is much more appropriate. The data model shows more than 40 years of life for a 16GB USB flash drive. That’s an outstanding endurance number for any electronic device. It’s comforting to know that even though it’s a tiny device, it can be trusted with many years of service for keeping the data safe. Our time and data models show promising results for the SSDs and the USB flash drives. If you’ve got data to move, the flash memory provides the fastest route available today. In the time model, the life of the drive is only shortened due to the incredible amount of data being written to the drive. In the data model, the casual and some professional users can take comfort in the results. The longevity of the 256GB USB flash drive pushing 700 years is as safe as it gets. Just before you go, only one note. As the drive fills up with data, the models need to be re-referenced. For example, if you manage to fill up half of your 16GB USB flash drive with data on the first day, you’ll only have the remaining 8GB for writing. Then it would be best to reference the endurance for the 8GB drive to get a closer approximation.